Prince Tamino (tenor Ben Bliss) runs for his life from a giant serpent. Photo by Steven Pisano; courtesy of Opera Philadelphia. Take one Buster Keaton 1920s comedy and mix it with Disney’s animated “Fantasia” and early black and white MIckey Mouse cartoons; then manage to substitute real people for the central animated characters and have them sing opera, and manage to have it all appear to be a seamless, integrated whole, and have it work to convey a great work of art. All that’s left is listening to audiences laugh, cheer, and applaud. 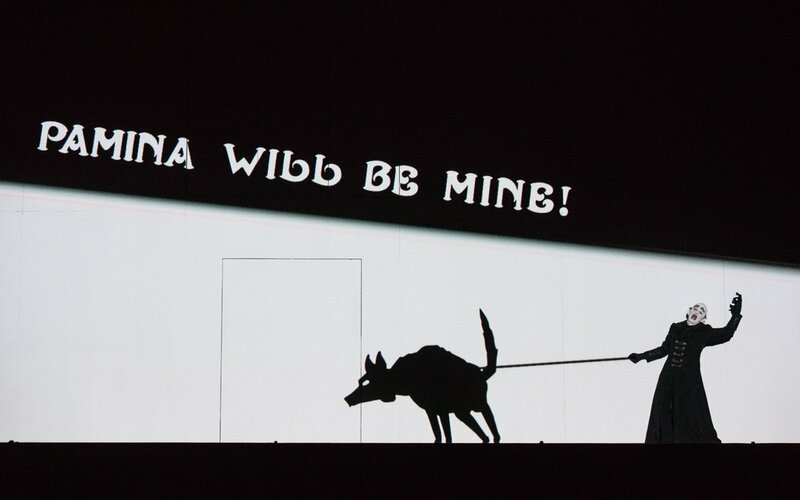 That is what the creative team of Barrie Kosky, Susan Andrade, and Paul Barritt have done in their highly imaginative version of Mozart’s opera, The Magic Flute, and they started from scratch, generating the animation themselves; this production premiered in Berlin in 2012 and has been produced previously in the US; however, Opera Philadelphia is providing its only appearance on the east coast as a part of Festival O17. This version might or might not become your favorite Magic Flute, but there is no denying that it is fun-filled and an impressive artistic achievement. The Queen of the Night (soprano Olga Pudova) tells Tamino (tenor Ben Bliss) that her daughter has been kidnapped by Sarastro, the High Priest. Photo by Steven Pisano; courtesy of Opera Philadelphia. The plot of The Magic Flute (known as Die Zauberflote in German) by composer Wolfgang Amadeus Mozart and librettist Emanuel Schikaneder is a loosely connected fantasy that readily lends itself to different interpretations and staging. Briefly, Prince Tamino goes to rescue a love, Pamina, he has only seen in a portrait as a queen tries to use him and his love, her daughter, in her battle with a ‘supposedly evil’ sorcerer, Sarastro. Papageno, a less virtuous bird catcher is added for comic effect and a contrast in morality, as is Monostatos, keeper of the detained Pamina, who has his own designs on her. The Opera Philadelphia version is superb. Sitting down and awaiting the performance, you see a movie screen on stage. Some sections of the screen appear to be cut into door-like panels. The screen is to be used for animated projections throughout and the panels rotate at various times to add the singers to the action with the animation adorning them in addition to any costume; the animation allows greater access to imagination and fantasy – think “Fantasia”. The opera opens with Tamino, appearing in a cut out, center stage, his top a costumed human, his animated legs underneath moving with comic rapidity, as he flees a dragon (not seen) through a forest; the stage could have only allowed a human Tamino with normal legs to take a few steps in real action. The only human part seen of the Queen of the Night is her face; otherwise she appears as a very large spider whose legs move about and can throw knives. The three spirits, young boys in costume, are made to look like butterflies with animated wings. Characters also move across the stage and must move with precision to be in sync with the projected animation; they are impressively adept at doing this. The acting is vaudevillian, reminding me of a Buster Keaton silent film and Papageno’s hat does look Keatonesque. The recitatives are not sung or spoken, but appear as written text on the screen in comic book style renderings, accompanied by Mozart pianoforte selections. This keeps with the silent film spirit of the production and adds to the fun, but suffers in a loss of emotion that the singers might otherwise convey, another key I think to differentiating this production from previous versions. The deft and stylized movements of the humans convincingly merge their characters into the animation. Pamina (soprano Rachel Sterrenberg) is soothed by the three spirits (A.J. Owens, Patrick Owens, and Damian Ferraro), as butterflies flutter; Photo by Steven Pisano; courtesy of Opera Philadelphia. I have nothing but praise for the singers, the chorus, the conductor, and the orchestra. It is to the director’s credit that no one singer or aspect overshadows the others; all players are well-suited for their roles and gave satisfying, sometimes thrilling, performances. For me a critical element of The Magic Flute is that the soprano playing the Queen of the Night must nail the aria, Der Holle Rache, and soprano Olga Pudova did; her knife-throwing spider body provided the visual tension. The parts for the groupings of three ladies serving the Queen and the three young spirits were beautifully sung; and the chorus was attention-grabbing. Special kudos also to Ben Bliss, Rachel Sterrenberg, and Jarrett Ott for their performances as Tamino, Pamina, and Papageno, all excellent. Mozart’s music was faithfully executed by the orchestra under David Charles Abell’s baton. This production is a well-balanced whole. In silent film style, Monostatos (tenor Brenton Ryan) moves across the stage, determined to capture Pamina. Photo by Steven Pisano; courtesy of Opera Philadelphia. One might muse whether mixed real/animation represents one possible future direction of opera. Opera companies are certainly looking for ways to update and present the most popular operas, written hundreds of years ago, with more contemporary connections and appeal. Furthermore, opera companies are including lighting and video special effects as routine elements now. I think this approach does, however, have some challenges. While this mixed real/animated version of The Magic Flute succeeds in serving up amazement and delight, I think it less effective in portraying the human side of opera. Emotion in the recitatives is largely lost when it is read rather than spoken; the Queen of the Night and Pamina are constrained to cartoon movements in their scene together, lessening the heart-breaking impact of their confrontation; and while Peixin Chin, as the High Priest Sarastro, has the right voice and sang well, I found his portrayal adorned as a rich gentleman from 19th century England lacking in awe and mystery. So, would this approach work for Mozart's Cosi Fan Tutte or Don Giovanni? While this approach works here and might for others, it won't for all. Perhaps this team will show us more that can be done with this approach, and inspire other creative teams as well. And there is no reason not to have both. Seeing Opera Philadelphia’s production of The Magic Flute should not keep you from seeing the Julie Taymor production at the Metropolitan Opera, but neither should having seen the Taymor production keep you from seeing the Opera Philadelphia production. I view Taymor’s production as having slightly more charm and a deeper emotional connection, and Opera Philadelphia’s production as excelling in fantasy and childhood delight. They are very different, but both are wonder-filled versions of Mozart’s great work, each with their own flavor of joy. The three ladies (soprano Ashley Milanese, soprano Siena Miller, and mezzo-soprano Anastasila Sidorova) give Papageno (baritone Jarrett Ott) back his voice so he can help Tamino (tenor Ben Bliss) in his trials. Photo by Kelly & Massa Photography; courtesy of Opera Philadelphia. Tamino (tenor Ben Bliss) and Pamina (soprano Rachel Sterrenberg) are kept apart by Sarastro (bass Peixin Chen); the swinging pendulum of time keeps pushing them apart. Photo by Steven Pisano; courtesy of Opera Philadelphia. The Fan Experience: My wife and I headed out of Tysons Corner, Virginia half past noon on Friday, planning to reach our hotel, the Hyatt Bellevue in Philadelphia, in time to have a nap and get to dinner at Barbuzzo. The hotel is a block away from the Academy of Music and my wife had a free night to spend. The trip to Philly should be about a three hour drive, but traffic on I-95, as is oft the case for I-95, had an accident just south of Philly. No nap and late for dinner, but the restaurant honored our reservation anyway. And thank goodness, the food at Barbuzzo is practically worth the trip itself, farm to table and modestly priced. Did cause us to miss the pre-opera talk, however. When you buy tickets from Opera Philadelphia, you are entered into their system and you will get reminders by email that include other offers and helpful information. I am impressed by the opera leadership being shown by Opera Philadelphia; see my overview of Opera Philadelphia’s 2017-2018 season. I regret that circumstances prevent my wife and I from attending all the exciting offerings of O17. For a listing of dates of remaining performances, see the OperaGene’s blog sidebar (at the bottom on mobile phones).